We are pleased to announce release of the 0.7 version of the Blue Whale Processing Geophysical Software. The 0.7 version is available for download in the Downloads section. Your installation of 0.6 version will be upgraded automatically. Development version 0.7 will not be switched to the release version automatically, please uninstall the development version and install the stable release version instead. Extended data editing features, copy/paste groups of cells from/to a spreadsheet program, undo/redo. Mapping module with live data contours maps. Regional terrain corrections module supporting Hammer method and Plouff method computation based on SRTM3 digital terrain model. 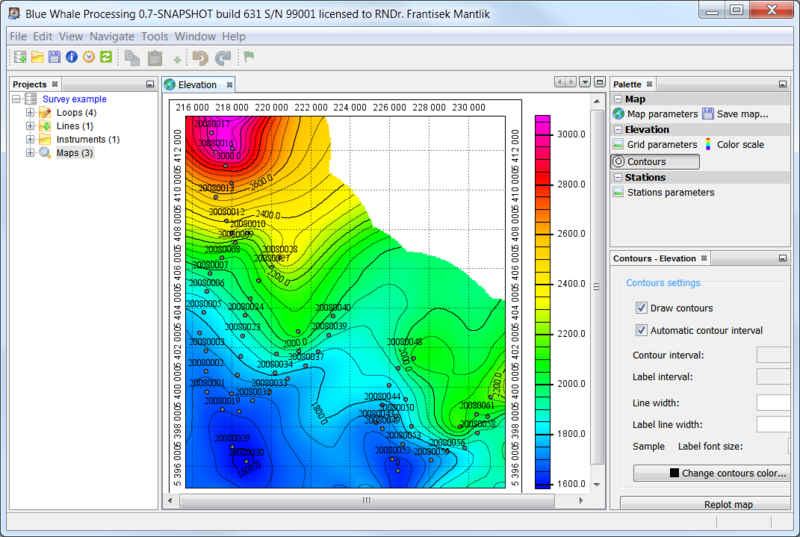 Enhanced referencing and coordinate systems transformations, support for EGM-96 elevation datum. Support for UTM coordinates input. Experimental line profile plot with implementation of modified Nettletton method for reduction density estimation. Tool for multiple readings selection inside a gravity loop. Shift readings time tool applicable for a loop or entire project. Allows fixing incorrectly set time or time zone in the gravimeter. In addition, tool for estimation of the proper time shift from the repetitions statistics is included. Experimental support for Mac OSX. Detailed description of new features can be found in the User’s Guide.